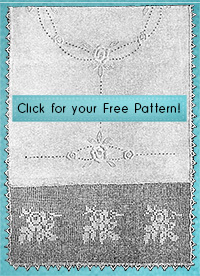 Decorate a guest towel with this simple insertion originally designed in 1920 by Emma L. Boardman. For a fast gift, buy a pretty plain towel, crochet the insert until it’s as wide as the towel, then sew it on to the towel. You can ﬁnish with the edging or leave it oﬀ.